The loggerhead turtle is a species of the Cheloniidae family. It is a species of sea turtles rapidly receding, which is locally subject to a restoration plan. This species, few pelagic, frequent usually temperate waters and sometimes tropical and subtropical waters. This is the only turtle nesting outside the tropics. Grouped by several hundred of individuals, they are able to travel considerable distances from their living site to reach laying grounds. In the Mediterranean, the loggerhead turtle is the most common species. It is also the most common turtle in the western Atlantic. Loggerhead, carnivore, feeds mainly on crustaceans and molluscs; it can weigh up to 160 kg and the average weight of an adult is 105 kg. It can measure 1.25m but average adults measured 1.10m. Dedicated to swim offshore, the members of this great sea turtle serve both thrusters (front legs) and steering (back legs). Its carapace is heart-shaped, flattened, its width is about 76% of its length. Its head is quite long and very wide. There are two pairs of prefrontal scales on the head and a strong horny beak. The shell can be recognized to have five pairs of side plates, a front pair adjacent to the precentral plate and three pairs of inframarginal plates on front. As the hawksbill sea turtle, it has two claws on each flipper. Like other sea turtles, the females lay their eggs only every two or three seasons. The age of sexual maturity is estimated at more than 10 years. 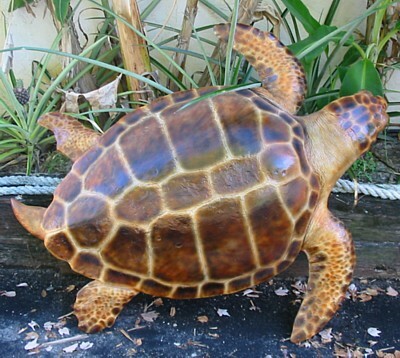 Most loggerheads that reach adulthood live 30 years or over 50 years. In the Mediterranean laying is from April to September on sandy beaches. Females lay from dock for 4 to 7 times per season and deposit 64 to 198 eggs each time. Incubation lasts 45 to 65 days. The adults gather near the nesting sites to mate before laying.